To best appreciate seeing Paris by bike, here are some safety suggestions, in the form of a quiz from Mark Cramer, who has cycled in Paris for more than 10 years. (b) Defend your turf, even if the cars behind you have to wait. Answer: Cycling within the door zone of parked cars could be lethal. I’ve been doored five times (that’s in 10 years of daily commutes). Three of those times it was my fault for being in the door zone. There’s an asterisk to this statistic. On one of those occasions I was following two bicycle policemen, using them as personal body guards. The first policeman passed a parked yellow mail truck. No problem. The second policeman passed the yellow mail truck. No problem. I was safely tucked behind them. So I followed. The yellow door opened just as I got to it. Down I went. The answer is to defend your turf and stay in the traffic flow. Most drivers behind you have been softened to understand your plight, thanks to pro-bicycle publicity. 2) You’re in a bike lane or shared bus-bike lane, and you see a delivery truck ahead occupying your path. (b) Wait until you are near the delivery truck and then, watching carefully behind you, swing out into the flow of traffic when it’s safe. Answer: No simple answer here, but I've found drivers do not expect you to move into their path until you're close to the delivery truck. So you're more likely to make eye contact with the car drivers in the traffic flow when you are nearer to the delivery truck. 3) You are approaching a red light. (b) If no pedestrian is crossing in front of you, pedal beyond the crosswalk, so that a driver planning on turning right will see you and not sideswipe you. Answer: The letter of the law says you have to follow (a) but in fact (b) is safer. On one occasion I was stopped by a pair of traffic cops after I had nudged past the crosswalk. My explanation: for reasons of safely I was doing what they do legally in Copenhagen. The cops were not impressed. They gave me a stern warning but no ticket. 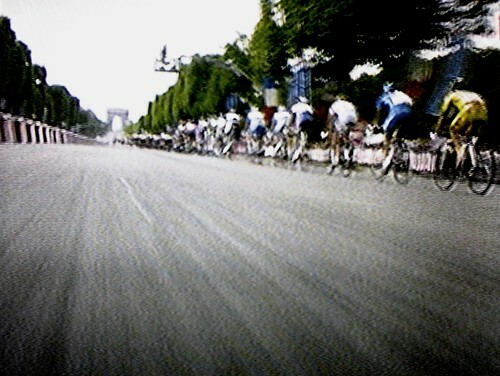 4) You are about to cross the Champs-Elysées and the light is still green. (b) Stop at the intersection and wait until the next green light. Answer: The boulevard is so wide that if you begin crossing in the last seconds of green, you will be caught in the middle when the light turns red. With no centre island, you’ll be hung out in the crossfire. 5) You are on a well-marked bicycle path that shares part of a boulevard promenade, such as the one that passes by Montmartre (Metro Anvers) and by the Moulin Rouge (Metro Blanche). (b) You have to keep your eyes glued on the lane, in case a pedestrian darts across. Answer: City planners imagined that pedestrians would get used to sharing the space with bikes. This has not happened. Strollers have ample space of their own, but bike lanes are rarely free of errant pedestrians. The answer is (b). See Mark's guest blog on the growth of bicycle culture in Paris. You can read more about the grassroots campaign that encouraged the city's administrators to become more bicycle friendly here. You can read more about how years of campaigning by cyclists ultimately led to a more cycle friendly Paris on our guest blog by campaigner Audrey de Nazelle. Paris: Women & Bicycles is a photographic book by Gil Garcetti that celebrates cycling culture among the women of Paris. For fans of cycle sport, Paris-Roubaix: A Journey Through Hell is a wonderful overview of one of the legendary one-day race. (Gerry Patterson cycled the route for Freewheeling France and has this report. His tips for surviving the ride are here). Graham Robb (see our interview here), author of the excellent The Discovery of France, has written Parisians: An Adventure History of Paris, which includes Robb's discovery of a col in the French capital. For tourist guidebooks to Paris, see Lonely Planet's Paris city guide, the Pocket Rough Guide to Paris, or Time Out's Paris guide. For city maps, see DK Eyewitness' tourist map or Michelin's Paris city plan. Michelin's Outskirts of Paris map is useful for getting in and out of the city. See also IGN's Paris and Surrounds map and IGN's Ile-de-France map. Some walks in City Walks Paris: 50 Adventures on Foot can be adapted to two wheels if you want to see Paris' tourist sites by bike. For bike hire in Paris, see our France bike hire listings. See our accommodation page to search for hotels, B&Bs, self-catered apartments, hostels and campsites. See Bruce McAleer's Cycling Fontainebleau to Milly for a lovely dayside outside of Paris. We will be adding more dayrides out of Paris to the site over the coming months. Mark Cramer lives in Paris and has been cycling in Paris for more than 10 years.